Since the inception of the TPPC, the Board of Directors has been steadfastly focused on reducing the risk profile of the Plan’s invested assets and diversifying the Plan’s investments. During late 2016, the TPPC undertook an Asset-Liability Study and, based on the results of this study, introduced an interim asset mix which resulted in a decreased allocation to traditional public equity and fixed income asset classes, and an increased allocation to non-traditional (private market) asset classes. This shift is a critical element of the TPPC’s investment strategy as such private market investments typically demonstrate less volatility than public market investments and yield a more stable return over a long-term horizon. During the second-half of 2017, the Board of Directors updated the Asset-Liability Study, which culminated in the approval of a new Strategic Asset Allocation in late 2017. This process largely validated the interim asset mix implemented in 2016, with continued increasing allocations to non-traditional asset classes. The Strategic Asset Allocation in place serves to maintain a Pension Fund return on invested assets equal to or greater than the discount rate of 6%, which is the long-term rate to sustain the Plan. The timing required to achieve the precise allocations as set out by the Strategic Asset Allocation is not precisely defined, and may vary for different investment classes depending on market opportunities and conditions. Achieving the prescribed allocation also considers that all of the TPPC’s risk parameters are respected. The TPPC anticipates it will take 36-48 months from the beginning of 2018 to fully deploy capital and achieve the strategic Asset Allocation. 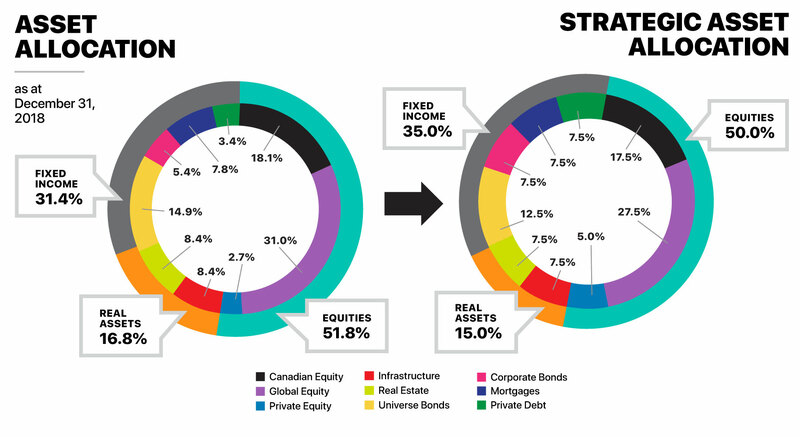 As the TPPC redeploys capital to the various private market asset classes, the weightings within the Canadian and Global equity and Universe bonds asset classes will appropriately realign towards the Strategic Asset Allocations.